Maybe it’s the early darkness but lightning/thunderstorms always seem to show themselves around this time. But from where does lightning come? Droplets of moisture in the air, flowing up because from the warmer ground, damages ice crystals in the clouds. 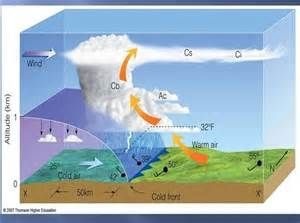 That friction destabilizes atoms creating negative ions that accumulate until the cloud gets too full to hold them all. The ground is positively charged so the negative ions in the sky beat a path to their more optimistic (i.e. positive) counterparts. As the negative charge approaches the earth, the positive charge reaches up and meets it. 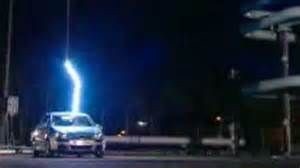 That’s why you can say sometimes lightning comes from the ground. Amazing too is that the heat generated, all by its lonesome in the air, is hotter than the surface of the sun. However, lightning is kinda picky in how it likes to travel. When the cloud gets too full, the ions are willing to travel downward through air but would prefer to travel through something else like wood, metal, or people. Obviously the best thing for us to do is to get inside during a storm. Being inside a car is better than nothing but be careful not to touch any of its metal parts. The rubber tires are not actually what keep you from being electrocuted; it’s the metal frame. The electric charge loves traveling through metal so much it just zooms down and out and doesn’t have time to penetrate the upholstery or plastic. However, if you’re directly touching the metal you will be electrocuted. If you’re is in the middle of a field during a storm, avoid trees, etc. and crouch on the ground but don’t lie down. After a strike, electricity travels through the ground and lying down gives more surface area, therefore more opportunity, for the charge to kill you than the bottoms of your feet would provide. 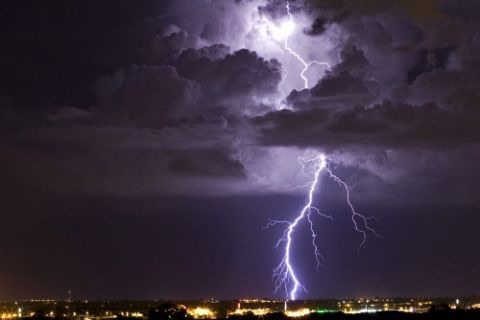 Fun Fact: Contrary to popular belief (or at least the way I learned it), the way to figure the distance between you and the lightning storm is not one mile for each second but one mile for each five seconds. If you count, “one Mississippi, two Mississippi…” five times, the storm is one mile away. Lightning is pretty amazing. It makes life on our planet possible but without knowing how it works it may also kill you. Previous What is Your Life’s Cost-Per-Wear?